Sunday was a cool, sunny day, and instead of heading out for my usual longer weekend run, I decided to exercise my curiosity more than my legs. 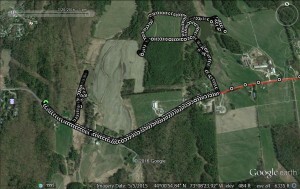 I have long wondered what I would find on some of the dirt roads and trails veering off of Quarry Rd. 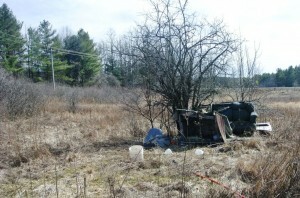 as the road heads east of the well used TAM trails which pass through Means and Battell Woods. Two trails in particular had caught my attention, having driven by them countless times over the last 30 years, so I parked my car at the TAM trailhead on Quarry Rd, put my ear buds in, setting up my “JBR” (Jeff B Running) running mix, and headed east to explore them. After a short jog alongside the road I came to the first of my points of curiosity, a snowmobile trail heading north (left) a few hundred yards from where I had parked my car. I have long been a big fan of running snowmobile trails; Even though I don’t participate in that pastime, the snowmobile enthusiasts share a common love of the outdoors, and do a great job maintaining their network of trails. So, I turned onto the trail, marked with a bright yellow sign stating “Sensitive Area – Stay on Trail.” Hopeful, as always, for a good run, I quickly found that this particular trail was a mess of muddy ruts, and piles of trash. I enjoy a good relaxing sit on a couch, but in the middle of a field? It probably took more effort to dump it there, than it would have been to simply take it to the transfer station? 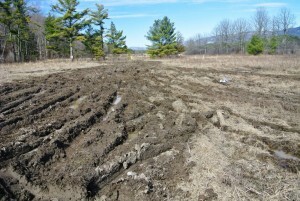 Despite the eyesore, I pressed on a short distance further, until the trail became a mess of ruts and mud, and from the sight of a barely street legal Subaru parked in the mud, I realized that I had stumbled upon a location where 4WD enthusiasts went to have a good time with their vehicles in the mud. While I found it funny, in light of the signs about this being a “sensitive area, and I assume they are enjoying their recreation with the permission of the landowner, I realized that this would not be a great place for my chosen form of recreation, so I turned around and headed back to Quarry Rd. with a few pounds of Addison County clay stuck to my shoes, giving me the opportunity to run with cement on my shoes. Returning to the road, I continued to the east for the next, more promising entry into the woods, the left turn heading to what I have relatively recently learned is the reason why we call this street “Quarry Road”. Pretty much everyone in Middlebury knows the Marble Works , and knows that this downtown commercial hub was the former site of the much of the activity based on the local marble industry for many years. 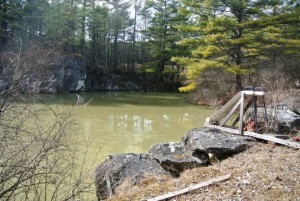 However, other than the spectacular OMYA pit just south of town, few people know of some of the original quarry sites. I had remembered reading a history of the local Marble Industry written by local historian Jan Albers, and published in the Addison Independent a few years ago, and with a few moments of googling was able to find it. It is an interesting article, and worth a read! I knew that the dirt road heading towards the old quarry was the road reached after the descent just east of Happy Valley Orchards, so I headed left down this road. 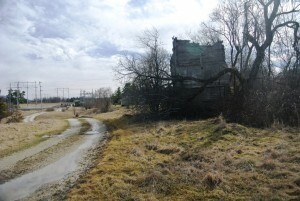 In Jan’s article, she referred to a still standing building that was used for storing marble chips, and I suspect that the dilapidated wood structure on a poured concrete foundation easily seen from the road is this structure. If you use your imagination, it kind of looks like the turret from a ruined castle. After a very short run, I came to an obvious quarry site to my left. The vertical rock walls and a few blocks of quarried rock left behind were the giveaway, and I was also amused to see a slide set up for it’s use as a swimming hole, although the murky brown water did not look particularly appetizing. Shortly after this, I followed the farm road into a large field out of sight from the traffic on Quarry Rd., and came across an old RV trailer set back up against the woods. While it didn’t appear to be occupied at this time, I can’t help but wonder if it once may have housed immigrant farm workers, as I have come across similar “out of sight, out of mind” lodging for farm workers in other well-hidden locations in the course of my trail running. Whether or not this ever was the case at this particular trailer, our state doesn’t currently seem to have any great urge to deport hard working people who do the milking jobs that most of us would not consider taking. I also came across a very well-built hunting stand, painted in camouflage to remain well hidden (said with a note of sarcasm) standing at the edge of the field. 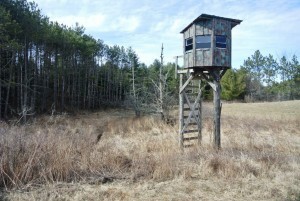 Curiously, none of the land described in this run was posted, but there was a small “NO HUNTING” sign on the door into this tree fort hunting stand. Winding through these farm fields, I came to a second, much larger pond, which didn’t look as “quarry-like” but didn’t seem to have a natural outlet, so it could also be a former quarry. A few migratory ducks and Canada Geese seemed to have found this to be a quiet place to take a mid-day break. 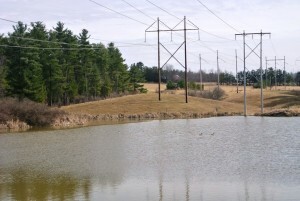 I tried to make a loop around the bigger pond, but had to retrace my steps as I realized that the terrain and barbed wire fence would make this difficult, returning to Quarry Rd, and eventually, my car. As I got closer to my car, I noticed a home with a few goats hanging out on the front deck, and they seemed mildly amused by my presence, and they did not seem as aggressive as the “attack goat” on Foote St., which a few years back seemed to enjoy accosting walkers and runners. I returned to my car, having stretched this into a 4.5 mile run. As long as the farm road to the old quarries remains unposted, it would make for a fun diversion by runners heading out on longer runs in the area. I'm avid hiker and runner who likes to combine these two pastimes while running the trails around Addison County. I also teach chemistry at Middlebury College.